Our popular Jack the Joker Fundraiser will continue this Sunday night in The Stables Bar where the Jackpot will be €3,928. This week Laura Morrissey was drawn out of the drum but did not find the joker but did win €50 while Jonathan O’Donovan and Maurice O’Donnell won €25. We appeal to all our supporters to continue purchasing the tickets as the funds raised will go towards our ongoing development works at the club grounds. Our club bingo will take place this Sunday night and this Sunday we return to the CBS Hall where the Jackpot is €1,800. On Sunday afternoon last Munster were narrowly defeated by Ulster in the Railway Cup Final in Armagh where our club was honored to have no fewer than three players on the Munster panel. Gary Hurney started the game at full forward and scored two points, while Shane Briggs and Patrick Hurney were members of the panel. On behalf of all in the club we would like to congratulate Coláistí na nDéise on their fantastic victory in the Harty Cup Final against Nenagh CBS last Sunday in Cashel. Representing our club on the day were David and Evan Collins, Brian Looby, Laurence Power and Eamonn Crotty who all become the first members of our club to win a Harty Cup medal and we wish the team the best of luck ahead of the All Ireland Semi Final on St.Patrick’s Day. This Friday night we play Clashmore in the first round of the Western Championship in Fraher Field at 8pm. Any visitors to the club grounds in recent weeks can see that work is progressing very well on the extension and refurbishment of the clubhouse and dressing rooms. All of the work is being carried out on a voluntary capacity and we must sincerely thank all those who are giving of their time so generously to complete this work. The next meeting of the club committee will take place in The Parish Office on Thursday night March 1st at 8 pm. Football training takes place every Wednesday evening under the lights at 6.00pm until 7.00pm for under 8’s, under 9’s and under 10’s. Friday - Indoor Hurling - New members welcome! New players are always welcome. Players should be at least 5 years old. Parents/guardians must be stay in attendance for the younger age groups. Any one interested in helping out with the younger ones please make yourself known to any of the coaches, as all help would be greatly welcomed. Membership forms and Code of Conduct forms for the under 12’s & 14’s have been given out during the week. Coaches are asked for their assistance in getting this done in an orderly and efficient manner and parents/guardians and players are asked to sign, complete and return as soon as possible. If anyone is interested in having their child join our club, we would invite them to come out to the pitch and speak with the coaches who will be happy to answer any questions you might have. We would also encourage any of our existing young members to bring a friend with them to their next training session and they can see at first hand what our club can offer them. Just to remind everyone that we are still walking every Monday evening at 6.30pm. Participants fill in an envelope at Centra and show whether they wish to contribute to the Juvenile GAA or SERT. The fee is €1 a mile and the walk is from Centra, out the New Line, down by St. Augustine's College in Duckspool and in the Burgery and back to Centra, which is just about 2 miles, so the cost per walk would be €2. The organised walk takes place each Monday at 6.30pm but people can walk anytime they wish. We will keep a record of the people walking and a chart will be available after a few weeks. That’s the reason for writing your name on the envelope. So far, over €600 has been collected for our club, well done and thanks to all and....keep on walking! Last Sunday was an historic day for Waterford hurling as Coláistí na Déise became Harty Cup champions for the first time ever with a fantastic display against Nenagh CBS. The lads were quick out of the blocks and led the game early on; a lead they would never relinquish. In an extremely tough and whole hearted match, there were some brilliant passages of play and they ran out deserving winners on a scoreline of 2-14 to 1-10. Well done to all players involved, particularly our club members Eamon Crotty, Evan Collins, David Collins, Laurence Power and Brian Looby. This is a marvellous achievement for these lads and they progress now to an All Ireland semi final. Last Saturday our under 9’s were in action again, one team travelling to Ballinameala for a blitz and one team going to Kilgobnet. They played 4 games each against all the local clubs and performed excellently in all matches. The panel that travelled to Kilgobnet were William Beresford, Seamus O’Sullivan, David Byrne, Oisin O’Riordan, Conor Kent, John Joe Queally, Mark Sheehan. The panel that went to Ballinameela were Rian Walsh, Kevin Keohan, Seanie Lenihan, James Murray, Sean Lanigan, Adam Carroll Lawlor, Joe Flynn, Jack Ahearne. Well done to all players and many thanks to the parents who travelled. Last week we our under 13 campaign started off. This year we have two teams in this championship again. We played Clashmore at home in Div 1 and ran out convincing winners. 7-12 to 0-2. Our other team travelled to Ardmore where the game was much more competitive. Ardmore started well and had a good lead after 10 mins. Our boys competed well after the slow start and there was very little in it at half time and 10 mins into the second half there was only a point in it. Ardmore fought back and got 2 quick goals and finished the stronger to win the game 6-11 to 3-7. Last Sunday our Div 3 team were in action at home to Ballyduff Upper. Ballyduff started the stronger and we were 4 pts down after 10 mins. Our lads settled down and the sides we level at half time. In the second half we become more and more competitive and had some great passages of play to recorded a 4-3 to 1-7 win. Next week we switch to under 14 football. We also have 2 teams in this championship. 33 different players got a lot of game experience at under 13 over the last 2 weeks which will help them all develop for the future. All players will be notified of times and venues during the week. Training 6:45pm Wednesday. Abbeyside / Ballinacourty Camogie Club was formed in 2011. All girls from the age of 5 are welcome to come along and join the fun. For the winter months we train on a Saturday morning in the Friary hall, from March on we move to the GAA pitch on a Friday evening. Helmets and Hurleys can be purchased through the club. For the year 2012 we have U8, U10 and U12 teams. The following is a list of our coaches, Maria Wright, Margaret Tritschler, Michelle Kiely, Ritchie Walsh, Conor Clancy, Sean "Hiker" McGrath, Eoin Daly, Paddy Kennedy and Tony Ruane. Camoige training continues every Saturday morning from 11:30 am where new members are always welcome. Thanks to all those who continue to support the Joker Fundraiser, which is helping in the redevelopment of the club grounds and when the girls resume outdoor training shortly it will be evident to all that a great deal of work has taken place. Anyone wishing to purchase a helmet at a reduced rate may do so through the club. Back Row (L to R): P. Cleary, M. Cosgrave, P. Kiely, V. Feeney, M. Kiely, D. O'Connor, M. O'Flynn, N. Cashin, H. Kelleher, M. Hanrahan, A. Barron, J. Fraher (Captain), L. Hanrahan, I. Gordon. Front Row (L to R): K. Lennon, S. Cleary, J. Moloney, E. Cashin, R. Goode, J. Kelleher, J. Hourigan, B. Lynch, J. Kiely, P. White, J. O'Donnell. 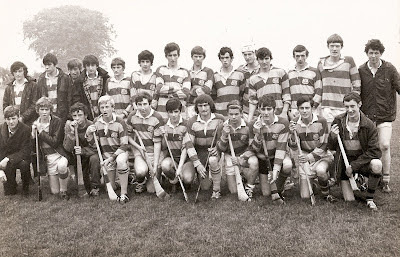 This week's photo shows the Abbeyside Minor Hurling team on the occasion of the 1970 County Final in Fraher Field. Having defeated Lismore in the Western Final, 5-8 to 1-9, they went on to take the County title with a 5-6 to 2-2 victory over Clann na nGael. In football they saw off Affane, 0-7 to 1-2 in the Western Final before going on to defeat Clann na nGael at Walsh Park in the County decider on a scoreline of 3-3 to 1-5. 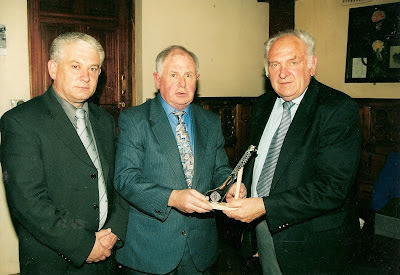 This was the first occasion that the club won a county double in the minor grade. Our popular Jack the Joker Fundraiser will continue this Sunday night in The Stables Bar where the Jackpot will be €3,624. This week Jim Egan was drawn out of the drum but did not find the joker but did win €50 while Michael “Cowboy” Cosgrave and Anthony Power won €25. We appeal to all our supporters to continue purchasing the tickets as the funds raised will go towards our ongoing development works at the club grounds. Our club bingo will take place this Sunday night and this Sunday we return to the CBS Hall where the Jackpot is €1,750. On Sunday afternoon last Munster defeated Leinster in the Railway Cup Semi Final in Parnell Park where our club was honored to have no fewer than three players on the Munster panel. Gary Hurney started the game at full forward and scored 1-02, Shane Briggs was introduced in the second half and Patrick Hurney was a member of the panel. It must be many a year since a Waterford club had three players on the Munster Football squad and we congratulate the lads on this fantastic recognition and wish them the very best of luck ahead of Sunday’s final against Ulster. On behalf of all in the club we would like to wish Colaistí na nDéise the very best of luck ahead of their Harty Cup Final against Nenagh CBS this Sunday in Cashel. Representing our club on the panel are David and Evan Collins, Brian Looby, Laurence Power and Eamonn Crotty. Please note that programmes will be on sale in Dungarvan Shopping Centre over the weekend so please show your support for the team by purchasing these. Friday 24th February – Indoor Hurling - New members welcome! Just a note to remind everyone that our popular indoor Friday hurling sessions continue every Friday evening for boys & girls and for ages 5 years and older and under 10 years. Hurleys will be provided, bring a helmet (if you don’t have one we'll get you one) €2 per child per night. In the interest of safety children MUST be dropped off and collected inside hall area. Last Saturday we had two under 9 teams in action, one team travelling to Ballinameela for a blitz and one team going to Kilgobnet. 17 Players from our under 9 panel represented the club with all players giving a great account of themselves. The panel that travelled to Ballinmeala were William Beresford, Brendan O’Mahony, Jack Ahearne, Seamus O’Sullivan, David Byrne, Oisin O’Riordan, Conot Kent, Seán Óg Flynn. The panel that went to Kilgobnet were Rian Walsh, Kevin Keohan, Seanie Lenihan, James Murray, Louis Campbell, Sean Lanigan, Adam Lawlor, Joe Flynn, Donnacha O’Dwyer. Well done to all players and thanks to the parents who travelled. Next Saturday our under 9's travel to Kilgobnet and Ballinameela to play in an indoor football tournament run by the Games and Development. Only players turning up for training will get a text. Membership forms and Code of Conduct forms for the under 12’s & 14’s will be given out during the week. Coaches are asked for their assistance in getting this done this week and parents/guardians and players are asked to sign, complete and return as soon as possible. These forms facilitate player registration and as the championship is just starting the forms for these age groups must be returned to the secretary by the end of the week. Many thanks to all of those in the under 16’s and minors who have already completed and returned their forms, your prompt co-operation is much appreciated. We would encourage any of our young members to bring a friend with them to their next training session and they can see at first hand what our club can offer them. Parents are especially welcome as well to see the coaching sessions and speak with the coaches afterwards should they have any questions. This week we're back walking for the club and SERT, so with over €500 collected for our club so far, well done to all and.....keep on walking! The Harty Cup final takes place this Sunday at 2.30pm between Colaistí na nDéise and Nenagh CBS. We would like to wish the best of luck to Eamon, David, Evan, Brian and Laurence. Welcome to a new feature on the club's website. Every week a photo will be posted showing teams, club personalities and significant events from the club's history. We hope you enjoy this look back at the club down through the years. If you have any photos that you would like to see on the site, please email them to info@abbeycourtygaa.com. This week's photo shows Club Chairman, Tony Mansfield making a presentation of a crystal camán to Austin Flynn to mark his selection on the Waterford Hurling Team of the Millennium. Also included is Paddy Joe Ryan, Waterford County Board Chairman. To commemorate the 45th anniversary of the amalgamation of the Abbeyside and Ballinacourty Clubs, we list the selectors, captains and vice-captains of the adult teams for 1967. Senior Hurling: P. Langan, M. Fives, J. Hourigan, A. Deasy, E. Feehan (Selectors), L. Enright (Captain), P. McGovern (Vice-Captain). Senior Football: P.J. Morrissey, P.J. Dwane, P. Norris, M. Fives, J. Hourigan (Selectors), J. Cosgrave (Captain), D. Murray (Vice-Captain). Intermediate Hurling: P. Langan, M. Fives, J. Hourigan, A. Deasy, E. Feehan, T. Mansfield (Selectors), J. Walsh (Captain), J. Dwyer (Vice-Captain). Junior Hurling: P. Langan, M. Fives, J. Hourigan, A. Deasy, E. Feehan, T. Mansfield (Selectors), P.J. Barry (Captain), D. O'Connor (Vice-Captain). Junior Football: P.J. Morrissey, P.J. Dwane, P. Norris, M. Fives, J. Hourigan, T. Mansfield (Selectors), L. Cliffe (Captain), D. Flynn (Vice-Captain). U21 Hurling: P. Langan, P. Enright, B. Shields, N. Keane, T. Mansfield (Selectors), P. Enright (Captain), B. Shields (Vice-Captain). U21 Football: P.J. Morrissey, J. Elsted, M. Power, J. Cosgrave, T. Mansfield (Selectors), M. Power (Captain), B. O'Connor (Vice-Captain). Our popular Jack the Joker Fundraiser will continue this Sunday night in The Stables Bar where the Jackpot will be €3,330. This week Michael Rossiter was drawn out of the drum but did not find the joker but did win €50 while Frankie Wright and Lauren Cliffe won €25. We appeal to all our supporters to continue purchasing the tickets as the funds raised will go towards our ongoing development works at the club grounds. On Friday night last our Minor Footballers took on Clashmore in the First Round of the Western Championship in our club grounds. It turned out to be a very entertaining game of football but it was our opponents who finished the stronger to run out winners by four points. Our club bingo will take place this Sunday night and this Sunday we return to the CBS Hall where the Jackpot is €1,700. The next meeting of the club committee will take place in The Parish Office this Thursday night at 8 pm. 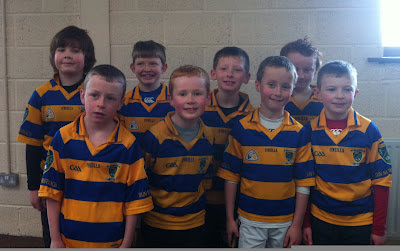 Last Saturday evening, a huge crowd of players and parents turned up at Scoil Mhuire for our 2011 medal presentation. Our Chairman Larry Cliffe welcomed everyone to the event and congratulated all of the teams that represented the club during 2011, not just the ones that managed to make it to a final. He also thanked the mentors and parents for their committment and continued support. Thanks also to Lar Hurney who presented the medals and trophies to the respective teams. Thanks to all the parents who helped out with refreshments and to all who turned up and help make the evening a sociable and enjoyable occasion. Membership forms are presently being circulated to the under 14's, 16's and minor squads. Many thanks to all of those who have already completed and returned their forms, your prompt co-operation is much appreciated. As mentioned last week Abbeyside/Ballinacourty GAA Club - Juvenile section have adapted a Code of Conduct or ask any of the coaches and they'll be happy to get a copy for you. All age groups have now been given this Code and this agreement form sets out in simple terms what is expected from the Coach, the Parent and the Player. Over the coming weeks, we'll briefly mention some of the main sections in this code, so as to help educate all of us as to what standards we expect when working with underage players. This code when properly implemented will encourage fair play, respect, equality, safety and no discrimination in all aspects of our work with children and young people. This week, the most important person in the club, and the clubs most prized asset is discussed, namely the "Player". Young players should be entitled to be safe and feel safe, be treated with respect, dignity and sensitivity and experience a sense of enjoyment and fulfilment. They should represent their team, club and their family with pride and dignity. They should respect coaches, mentors, officials and opponents, be gracious in defeat and modest in victory. They should never cheat and should always play by the rules. They should never use unfair or bullying tactics to gain advantage or isolate other players and they must adhere to acceptable standards of behaviour. Next week, the role of the "Coach" is outlined. This week we're back walking for the club and SERT, so with over €400 collected for our club so far, well done to all and.....keep on walking ! Table Quiz in Lawlors Hotel on Wednesday 15th February at 8 o’clock in aid of The Harty Cup Training Fund. Please come along and support the lads in their preparation for the upcoming Harty Cup final. Friday 17th February –Indoor Hurling - New members welcome ! Our under 8's were on the road again last Saturday morning with half the squad going to Ballinameela and the other half going to Kilgobnet to compete against other local clubs this time with the big ball and again without fail fun was had by all that took part with some fine individual performances produced by all clubs but above all team efforts were most noticeable on the day. Well done to all that took part and thanks to the parents who travelled and offered their support. A special mention must be given to Oisin Brasil who broke through to the ranks of the under 8 grade for the first time and looks to be an exciting prospect for the future. Welcome aboard Oisin. Medal presentation for Town and Country leagues took place on Saturday evening. We had nearly 50 players present for the presentation of trophies for this age group, we entered 3 teams in last year’s event. It is great to have such large numbers and much credit must go to the coaches involved to ensure all the players develop their skills. We would like to thank the team manager Pat Moore and coaches Tomas Walsh, Conor Barrett, Ian Kiely & Benny Kiely for all the work and commitment last year. This was a great evening for all our young players. Under 11 players: James Riordan, Johnny Treen, Jamie Walsh, Daithi Brunnock, Dean Beresford, Ben Flynn, Ruairi Cusack, Meldan O’Dwyer, Fergal Roche, Eoin Flynn, Sean Kent, Shane Kiely, Jake Moore, Jack O’Riordan, Cian Fagan. Our U12's traveled to Clonmel on Sunday afternoon to play our good friends Moyle Rovers in hurling & football challenge matches. The winter cobwebs were soon blown off and the lads got stuck in giving good performances in both matches. All agreed that this trip was well worthwhile and eagerly await the next game. Many thanks to Moyle Rovers for the tea and sandwiches afterwards. Hurling match on astro pitch on Friday night versus Sacred Heart, Waterford at 6.00pm. Meet at Abbeyside pitch at 5.00pm sharp. The under 13 Football championship starts off next Sunday, we have two teams in this again this year and have games against Clashmore and Ardmore. Details will be given at training on Wednesday evening. We played Clashmore last Friday night in the first round of the Western Minor football championship. We started very brightly and took some fine scores and were level at half time. Unfortunately Clashmore finished the game stronger and ran out winners at the end of a very tight game. We now turn our attention to the County Championship which begins this Friday night versus St. Patricks in Abbeyside. Throw in is 8pm and all support is greatly appreciated. Welcome to the new Abbeyside / Ballinacourty GAA Club website. We hope you enjoy browsing the various pages. If you have any photographs that you would like to see on the site please email them to info@abbeycourtygaa.com. Fixtures will be listed here as soon as they are available. Our popular Jack the Joker Fundraiser will continue this Sunday night in The Stables Bar where the Jackpot will be 3,000 euro. This week Marie Maloney was drawn out of the drum but did not find the joker but did win 50 euro while Trish Dunford and Eileen O’Donovan won 25 euro. We appeal to all our supporters to continue purchasing the tickets as the funds raised will go towards our ongoing development works at the club grounds. This Friday night, our minor footballers will be the first team into Championship action in the club, as they play Clashmore in our pitch at 8pm. Our club bingo will take place this Sunday night and this Sunday we return to the CBS Hall where the Jackpot is 1,650 euro. On behalf of all in the club we would like to congratulate Colaiste na Déise on their victory in the Harty Cup Semi Final against De la Salle college last Saturday in Fraher Field. From our club Evan and David Collins, Brian Looby, Laurence Power and Eamon Crotty are on the panel and we wish them the very best of luck in the final in two weeks time. Camogie training will return this Saturday the 11th starting in the Friary at 11.30 for 5and 6 year olds and 12.30 for all other age groups new members always welcome. Well done to all involved with Colaiste na Deise who had a great win over De la Salle in the Harty cup semi final and best of luck to them in the final which goes ahead on the weekend of the 25th of Feburary. Best of luck to St Augustines senior girls who play in the All Ireland semi football final against St. Flananans in Tipperary town today. As always the joker can be bought through the club just ask Claire or Carmel any Saturday this fundraiser will benefit our girls in the future so all support is very welcome. Friday 10th February –Indoor Hurling - New members welcome! Just a note to remind everyone that our popular indoor Friday hurling sessions continue every Friday evening for boys & girls and for ages 5 years and older and under 10 years. New players are always welcome. Players should be at least 5 years old. Parents/guardians must be stay in attendance for the younger age groups. Anyone interested in helping out with the younger ones, please make yourself known to any of the coaches, as all help would be greatly welcomed. Abbeyside/Ballinacourty GAA Club- Juvenile section have adapted a Code of Conduct in accordance with GAA guidelines. All age groups have now been given this Code and this agreement form sets out in simple terms what is expected from the Coach, The Parent and the Player. Code of Conduct & Membership Forms for the younger age groups (ie ages 6 to 12 year olds) or what we call the "go -games" groups will be given out next month. Our new Chairman Larry Cliffe, along with the juvenile committee, met with coaches of all the age groups last week, where he emphasised the importance of EVERY child getting a chance and each child being treated fairly and equally. Particularly at the age groups of up to under 12 where the ‘Croke Park - Go Games ‘ principle applies, Abbeyside/Ballinacourty Juvenile section will endeavour to ensure that these principles will be adopted and followed . With this in mind and we would encourage any of our young members to bring a friend with them to their next training session and they can see at first hand what our club can offer them. Parents are especially welcome as well to see the coaching sessions and speak with the coaches afterwards should they have any questions. Larry, along with some committee members will be visiting the local schools over the next few weeks to spread the word. €400 collected for our club after 3 weeks, so well done to all and.....keep walking! This week the focus of the Walk will turn to the families of the Union Hall Sea tragedies, where proceeds raised for this week will be collected for their benefit. So we would encourage as many people as possible to get walking and support a worthy cause. 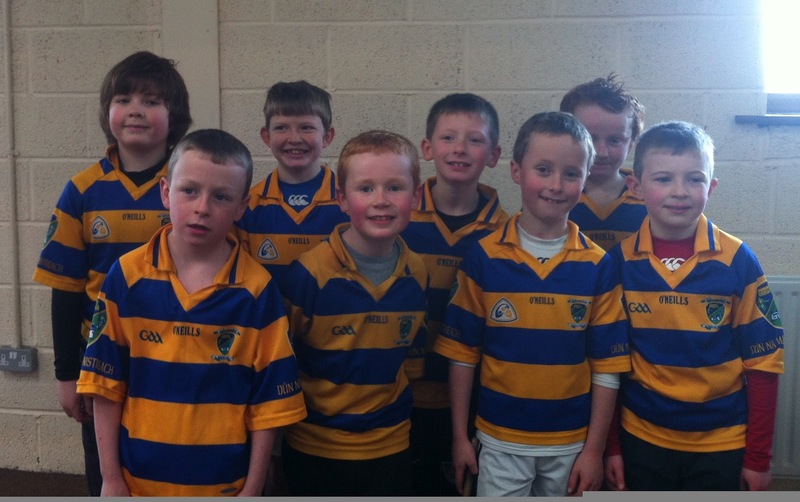 Our under 8's took part in their first hurling blitz of the year on Saturday morning last. Our squad was divided into two teams of 7 aside to fill fixtures in Ballinameela and Kilgobnet. Half of our team, consisting of M. Walsh, J. Kiely, E. Spratt, L. Cummins, C. Gough, A. Norris and T. Nee togging off in Ballinameela which left the other half of J. Mcgrath, C. Treen, S. Callaghan, R. Cosgrave, E. Kiely, R. Tyrell, F. Slevin and B. O’Connell being drafted in from our under 7's to make up a team of 8 togging off in Kilgobnet. A fine team performance was witnessed in both venues and the main aim of these events was focused on fun for all. Well done to all the clubs who took part on the day as the "fun for all" motto truly fitted the bill on this occasion. Thanks to the complex management in both venues as everything went off very smoothly throughout the morning. A special thanks to Michelle Power the Games & Development officer who organised these fixtures to a tee, as we all know kids love and need games. Next Saturday the 11th sees the same teams travelling to the same venues only this time it will be football so don't forget your Ballinacourty jersey lads for another fun filled morning! Best of luck to all involved. Another fantastic and wholehearted display from the Colaiste na nDeise against De La Salle on Saturday last. For the second game running, they were reduced to 14 men before the ball was even thrown in. It seemed to only drive the lads on further because they produced a fantastic half of hurling. They held their lead and won comfortably in the end. The final will be played the weekend of 25th/26th February against either Ardscoil Rís or Nenagh CBS. Well done to our club members involved on the day. There will be a medal presentation on Saturday 11th February at Scoil Mhuire at 8.00pm. This is for our U12’s, U14’s and U16’s who won various western and county titles last year and also for those who represented their county in the primary games.